Climb aboard an ancient Spanish galleon lost in time as a Coast Guard officer tracking an elusive criminal in Mayan Prophecies: Ship of Spirits. As you explore the vastness of a ship lost in time, what mysteries will you uncover amidst its Mayan idols, menacing sea creatures, and exotic treasures? 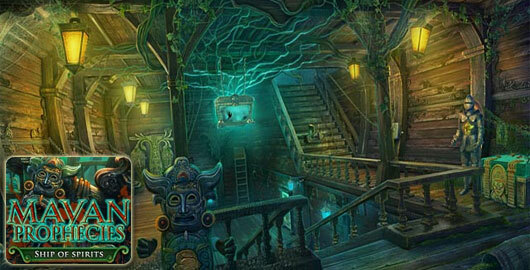 Find out in this exciting new Hidden Object Puzzle Adventure game on the open seas! Switch to Hidden Objects or Mahjong scenes. For a more in depth experience, check out the Collector’s Edition! Mayan Prophecies: Ship of Spirits walkthrough! Posted on Saturday, November 3rd, 2012. Follow any responses through the RSS 2.0 feed.